Courtesy cars available – including our very popular Audi TT! Pop in any time for a FREE health check. It’s not just the TV that breaks down at Christmas, but please make sure it’s not your car. 1. Cover the bases. If the weather forecast is looking bad or just uncertain and you need to drive, then make sure your tank’s full; if you get stuck in bad weather you can keep the engine running and stay warm until help arrives or conditions become less severe. Having the right tyre pressure is vital whatever the weather, but in wintry conditions check the tread: the legal minimum is 1.6mm, but it’s better to have a deeper tread of at least 3mm, as it will be more effective at clearing water. If you haven’t put antifreeze in your car since the summer, now’s the time to do it. 2. See and be seen. The combination of icy conditions and grit on the roads means you’ll use more screen wash than normal, so put a spare bottle in the boot with a can of de-icer and a plastic scraper. Keep a second can of de-icer at home and you’ll be able to deal with frozen locks quickly first thing in the morning. Windscreen wipers should also be checked now because worn ones won’t be effective against sleet and snow and you can’t drive blind. If it gets misty outside, keep dipped headlights on, if it gets foggy, then turn your fog lights on; you’ll be more visible and you’ll see more too. 3. Put the right equipment in the boot. Take an old sleeping bag (which makes a great duvet), a hoodie and a pair of gloves; shove them in a dustbin liner, put the lot in the boot and forget about it. You may never need to use them over the winter period, but you’ve got the kit just in case. You probably already have a torch in the glove compartment, right? If you haven’t, put one in now. Should the weather forecast indicate that snow is a possibility, it makes sense to keep a shovel and a couple of pieces of cardboard or old carpet in the boot too; it could help you or another motorist out of a tricky situation. If you do set off on a journey, run out of petrol, a snow storm starts and you’ve forgotten to put warm clothing in the boot, at least you’ll be able to call for help, because you’ve kept your mobile phone fully charged. Yes? If you’d like more advice on making sure your vehicle is ready for winter conditions, please call us on 01206 211483 or call in: Unit 4 Prince of Wales Industrial Estate, London Road, Marks Tey, Colchester, Essex CO6 1ED. Merry Christmas and drive safely! Four times a year for the last three years, Paul Miller, manager at the Marks Tey based John Austin garage, has been successfully running free Pit Stop Workshops on Saturday mornings to help people learn about car maintenance using a practical, hands on approach. The third one of this year was held on Saturday 11 August. “Cars are so complex these days, there is very little we can to do if something goes wrong, so it’s easy to become a bit complacent with more general maintenance. This inevitably leads to problems which could have been avoided, not to mention higher repair bills,” said Paul. The Pit Stop Workshop is designed to reduce the fear of basic car maintenance through familiarity. It gives people the confidence to know that if they are stranded with a flat tyre and the phone’s dead or there’s no signal, they can handle the situation. As this is not covered as part of the driving test, it’s a good opportunity for those learning to drive to come along and give themselves a head start. After Paul had put everyone through their paces, it was time for a rest and free coffee and cake at The Food Company! The John Austin final Pit Stop Workshop of the year will be held on Saturday 17 November. We know from our customer surveys that over 95% of our customers have come to us through referral. We really appreciate that, and we’d like to encourage and reward those referrals starting right now. We are therefore delighted to announce the launch of Pass it on. As the name suggests, this scheme will reward John Austin customers with a discount of 20% off their next service or repair and the person referred to us will receive a 10% discount. Technically, the referred person will now be a John Austin customer, so once they refer a new customer to us, they too will be eligible for a 20% discount. To get started, all our customers have to do is call in to the garage and pick up a Pass it on card. They complete their details and hand the whole card to a friend, colleague or relative who isn’t currently a John Austin customer; they add their details, book their vehicle in and then hand the card to us when collecting it to receive their discount. Our customers have up to 36 months to redeem their 20% discount and, as it CAN be used in conjunction with any other promotional scheme we may be operating, that discount could be even bigger. There is no downside to this scheme; it really is a win-win situation! In March this year we launched our loyalty scheme Rewarding Service, where customers receive a stamp for every £20 spent at the garage (on a service, repair, MOT and products). Once 20 stamps are collected, they, or someone they give the car to, can have their vehicle’s air conditioning serviced for FREE. So far we’ve had an amazing response; it’s just really sad that most of us haven’t needed to keep cool. Here’s hoping the summer comes soon. Want to get into the Olympic spirit of things? Read on. Colchester will be welcoming the Olympic Torch this Friday as part of the London 2012 Olympic Torch Relay. It is a real once in a lifetime experience where members of the local community will be running with the torch through the town. The team at John Austin are looking forward to being there to witness the event themselves, even if it is very early in the morning! Now we all know when the Torch will be arriving, but what route will it travel along? And where can you park? John Austin has the answers! The Torch will arrive on Ipswich Road at approximately 7:28am. It will travel down East Street, East Hill and the High Street, then on to North Hill. At the bottom of North Hill the Torch will turn left on to Middleborough where it will leave Colchester at approximately 8:16am and continue on the next leg of its’ journey to Hatfield Peverel. Anyone who wishes to see the Torch is advised to get there in plenty of time – the streets will fill up pretty quickly! Any traffic waiting to use the roads will be delayed for a short time and the Essex Police are asking for your patience in this matter. So how do you get there? Of course the best plan of action would be walking or cycling, or arranging something called a ‘walking bus’ where a group of you get together and walk to your chosen viewing point. However if you live that little bit further away you can drive and take advantage of the free parking that the University of Essex are offering on their Colchester campus. From here the closest point on the Torch Relay route is East Hill – about 30 minutes’ walk from the campus, where you can see the Torch on its journey through the town. It is recommended that you arrive at the campus early to secure a parking spot, as these will fill up very quickly too! We hope this information has helped you plan for the journey. If you want any further information you can visit the Colchester Council website at; http://www.colchester.gov.uk/article/6300/Olympic-Torch-Relay—Travel-Advice-for-Colchester where you can also find a list of different activities that are happening on the day, including a bouncy castle, Zumba class and face painting. 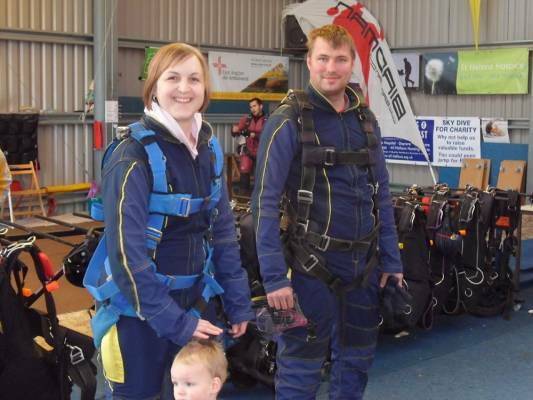 On Friday 27 April our manager Paul, and his new wife Gemma, completed a skydive to raise money for charity Help for Heroes in the name of Courtney Fraser, whose father was seriously injured in Afghanistan and is now unable to serve. They were up bright and early for an 8:30 start at Beccles Airfield, where they received training and some health and safety guidance. Then they were strapped to their instructors and ready to go; in fact Paul and Gemma had the skies to themselves that day because of the unfavourable weather conditions. They were given the chance to steer their own parachutes, which Gemma aptly described as “trying to hold on to an umbrella in the wind.” She landed safely in the field, but there was no sign of Paul. It turns out he had landed in a completely different field – and men say women are bad drivers! The couple raised £215 for Help for Heroes and adrenaline junkie Paul wants to do a bungee jump for their next fundraising event. Lucky Gemma. Paul Miller, manager at the John Austin VW & Audi Specialists Ltd. in Marks Tey, is doing a sponsored tandem skydive with his new wife, Gemma, to raise money for charity Help for Heroes. Gemma was hoping for a lovely relaxing honeymoon somewhere exotic, but instead she’s going to be plunging through the air at 12,000 feet a minute! A tandem skydive involves two people jumping out of a plane at an altitude of about 10,000 – 12,000 feet and freefalling at 120mph. The instructor you are strapped to will deploy the parachute at around 5,000 feet to slow you down so you can take in the amazing views and land safely. Paul and Gemma will be doing their skydive in Beccles, Suffolk on Friday 27April and are hoping to raise as much money as possible for ‘Help for Heroes’. You can help raise money by visiting the website: www.helpforheroes.org.uk. Marianne West the Help for Heroes Volunteer County Coordinator for Essex added that she was delighted that Paul and Gemma had chosen to support the charity with their skydive. One of the latest local projects to benefit from funds raised is the brand new Chavasse VC Centre in Berechurch Road, Colchester which will be officially opened on 8 May. . The build has been funded by £6Million from Help for Heroes and it will run the Recovery Centre, with the Army providing the staff required to deliver key recovery activities to serving and veteran soldiers. The Recovery Centre will provide a Support Hub, where a collection of welfare agencies and other services charities will give a ‘one stop shop’ of advice and support for serving personnel, veterans and their families – for life. The cold snap’s here – don’t get caught short!